Juventus’ Serie A clash against Napoli was full of drama in the opening thirty minutes, Pjanic scored a free-kick after Napoli keeper Alex Meret was sent off. In the 24th minute of the match, Alex Meret was sold down the river when Kevin Malcuit’s pass back to goal was short, Cristiano Ronaldo latched onto the wayward pass and Meret rushed out of goal to bring Ronaldo down and the Italian was shown a straight red card from the referee. Following Meret’s sending off, David Ospina – on loan from Arsenal entered the fray to take up a place between the sticks. 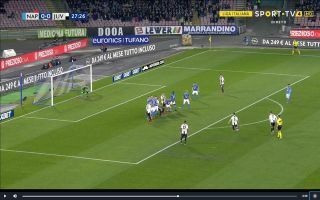 The Colombian conceded immediately as Pjanic stepped up to take the free-kick and lifted it over the wall and into the bottom corner. Pjanic is a deadly free-kick taker. Pjanic’s free-kick ability was too much for Arsenal loanee David Ospina to handle.